Although Moses Judah Leib ben Wolf Broda is the artist responsible for perhaps the most famous decorated Hebrew manuscript of the eighteenth century – the Von Geldern Haggadah of 1723, which may have been a source of inspiration for the Haggadah described in Heinrich Heine’s Der Rabbi von Bacherach – hardly anything is known about his life. He was born in the Moravian town of Trebitsch (now Trebic, Czech Republic), where the first scribe of the eighteenth-century school, Aryeh ben Judah Leib, originated as well. 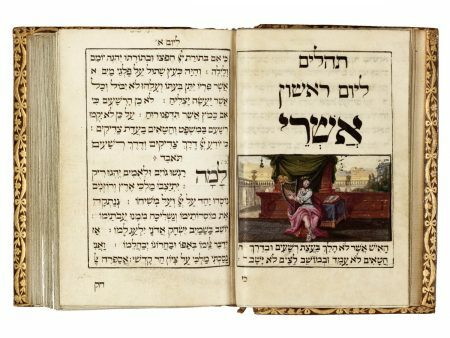 Including the Braginksy psalter a total of seven manuscripts by Moses Judah Leib are known, produced between 1713 and 1723. The manuscript has an architectural title page with Moses and Aaron standing in arches. The psalms are subdivided according to the days of the week on which they are to be read and, with the exception of the psalms for Friday, these daily sections have decorated monochrome or multicolored initial word panels. Following the first word of Psalms 1, ashre, on folio 6r, is a depiction of King David sit- ting outside on the terrace of a palace. He plays the harp while looking at an open volume, possibly his psalms. Moses Judah Leib was perhaps the most accomplished painter among his contemporaries. Two of his most famous Haggadot, the Second Cincinnati Haggadah (Cincinnati, Klau Library, Hebrew Union College, MS 444,1) and the Von Geldern Haggadah (private collection), contain full-page seder scenes that stand out as highlights of eighteenth-century Jewish pictorial art. Von Geldern Haggadah 1997; Sotheby’s Tel Aviv 1998, lot 36.